Welcome to Little Georgia, London’s authentic Georgian restaurants, where you can enjoy traditional & delicious home-made Georgian dishes. If you are searching for a different cuisine in London, and have never visited a Georgian restaurant, then Little Georgia is the perfect choice. There are two branches of Little Georgia, one in Islington, and one in Hackney. Both locations offer a stylish, but relaxed atmosphere, friendly staff, and traditional food prepared by Georgian chefs. Little Georgia Islington is the bigger of the two restaurants and is licensed. We offer a selection of Georgian wine – including artisanal – beer and spirits, including traditional Georgian Chacha – “grape vodka”. 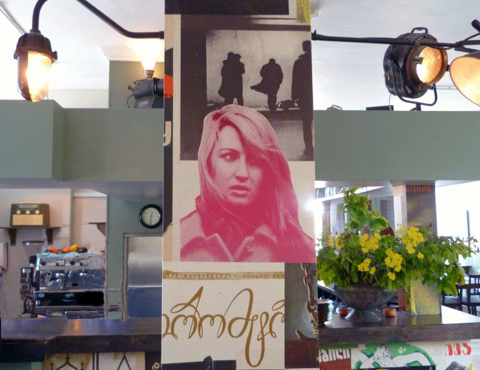 The décor is retro/vintage, and features Soviet-era posters and artefacts, and the atmosphere is lively but laid – back. Little Georgia Islington is the ideal destination to enjoy traditional Georgian food. Little Georgia Hackney is an intimate, cosy space, with a similar retro décor featuring original and period artwork. The restaurant is “bring your own bottle”, and there is no corkage charge. Both venues have unique atmospheres, making them suitable for both large and small groups. Order your office lunch delivery or let us cater for your wedding, parties and events. All our food is freshly prepared, using the best available ingredients, to create a truly authentic “taste of Georgia”. We offer a wide variety of vegetarian dishes, as well as traditional favourites like Khachapuri – mouth – wateringly delicious Cheesebread, and Khinkali – savoury pork & beef dumplings. Both restaurants have slightly different menus, so please check the menu pages for both Hackney and Islington. You can have your meal delivered to your home.